Switzerland’s picturesque locales form the backdrop of many Bollywood movies, especially that of Yash Chopra. The familiarity towards the place allows Indian tourists to avoid any guidance from Switzerland Tourism in these places. Here is a sneak peek of a few of these locations. How many times have we wished that the movies we saw on screen could, in fact, be real? That we could translate three hours of entertainment to something more exciting? Here is a chance where you can make the reel into your real life. The scenic settings of Switzerland that form the backdrop of numerous Bollywood movies is one such opportunity. Yash Chopra films have a special place for Switzerland. He has shot movies at Alpine meadows, its serene lakes and its charming towns and cities to convey sunshine, happiness and tranquillity. Switzerland has been a favourite among other Indian filmmakers as well. Filmmakers now, however, seem keen on exploring newer locations too. From Amitabh Bachchan and Rekha in Silsila, Rishi Kapoor and Sridevi in Chandni to Shah Rukh Khan and Kajol in Dilwale Dulhania Le Jayenge (DDLJ), Chopra-style romance is incomplete without chiffon saris swirling in Switzerland’s emerald green forests and valleys. Chiffon saris and the Swiss Alps are so synonymous with his style that Switzerland Tourism even offered visitors a guided tour of the places where the director filmed some of his most famous songs and other sequences. Alpenrausch Lake also called ‘The Chopra Lake’ after him reflects the charisma he left in Switzerland. Bollywood has been featuring Switzerland in films for the last 50 years. Beautiful Swiss mountains and Valleys and mesmerizing views have attracted film production houses. Movies such as Sangam, An Evening in Paris, Ajnabee, Biwi No. 1, Kunwara, Hero: Love Story of a Spy, DDLJ, Chandni, Dhoom 3 and Krrish 3 were partially shot in Switzerland. Gstaad region is considered as one of the most scenic film sets in the world. Many Bollywood blockbusters have been filmed here. Celebrities and movie stars even spend their holidays and honeymoons in this region. Gstaad is renowned as ‘romantic haven’ for globe trotters across the world, a town where many sweet verses have been sung and re-lived for decades. The song Zara sa jhoom loon main… from DDLJ was shot in the famous Gstaad Promenade by Yash Chopra. 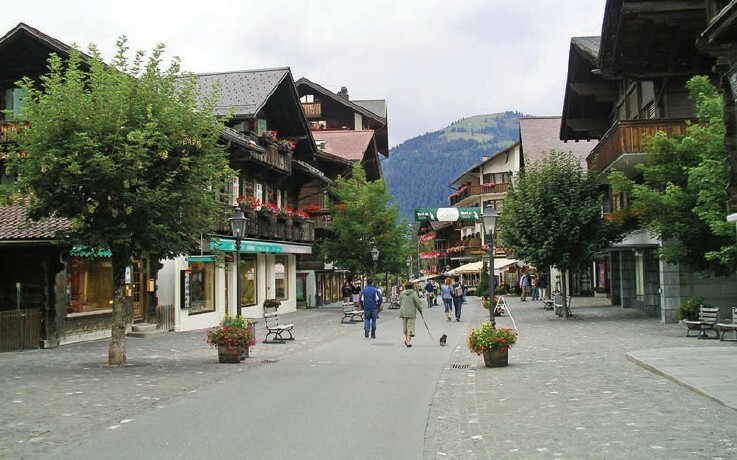 Lined with beautiful wooden chalets and boutiques that may burn a hole in your pocket, Promenade is the focal point of Gstaad. Shopping aside, Gstaad exudes old-world charm and has many newlyweds celebrating their love on a horse carriage ride. Get ready to be whisked away in one with your beloved, just like Shah Rukh and Kajol in DDLJ, at sundown. At night this Swiss town transforms into a fairytale – like setting, it is recommended to drop by at Early Beck Shop for a sweet summer chocolate treat. This delightful store has been featured in Bachna ae Haseeno, another romantic movie starring Ranbir Kapoor and DDLJ. Some of the must-haves here are Saane Gibeni, Gstaad nut cake and Pavés de Gstaad. You can also head to Charly’s for divine pastries and a mug of good ol’ hot chocolate. As far as local life is concerned, Gstaad is primarily a ski town and has its fair share of summer treats for both tourists and locals. The city is known for its grand Gstaad Promenade Party. From traditional fare to acquiring new tastes in wine and champagne, this festive event is the epitome of style, culture and novelty. Adjacent to classy yet traditional town of Gstaad are two Alpine destinations you simply cannot afford to miss-Rougemont and Chateaux d’Oex. 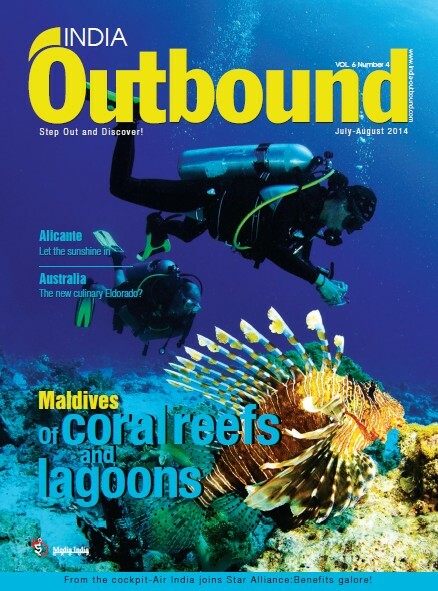 Rougemont has emerged as one of the sought-after tourist spots. 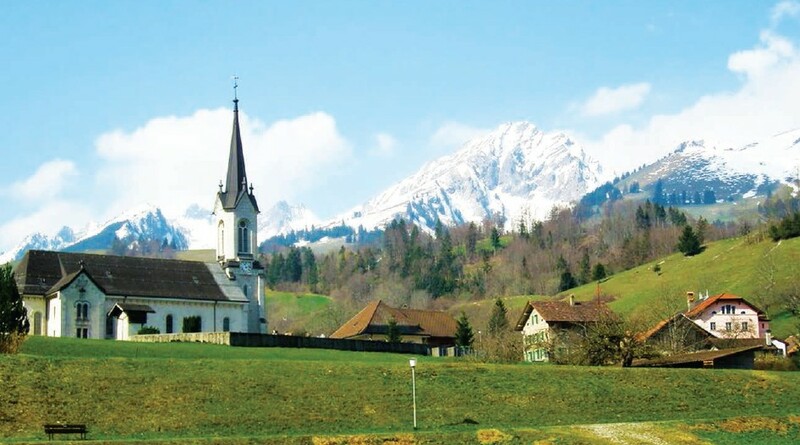 Bollywood film makers prefer its convenient location over the charming villages of Gstaad for filming. What attracts the people here is a beautiful castle known as Schloss Rougemont. With hints of Romanesque architecture, this grandiose castle has been used as prime location for films such as Hum Aapke Dil Mein Rehte Hain and Jodi No. 1. If you wish to get a bird’s eye view of the stunning Swiss landscape dotted with chalets and meadows blossoming with summer flowers, head to Chateaux d’Oex-an Alpine village where romance is re-lived from heavens above (quite literally!) with a balloon ride. Although the International Hot-air Balloon Festival is held during peak winters, you can fly over the picturesque Swiss plateau any time of the year. Vivre d’amour et d’eau fraîche-To live on nothing more than love and fresh water-is a common French saying that best describes Interlaken, a town situated between two Alpine beauties, Lake Thun and Lake Brienz. Picking only one lake to visit is as tough as choosing which of your kids you love more. While Lake Thun, located at a short distance from Interlaken West, leaves you spellbound with medieval castles, Brienz is mecca for nature lovers. 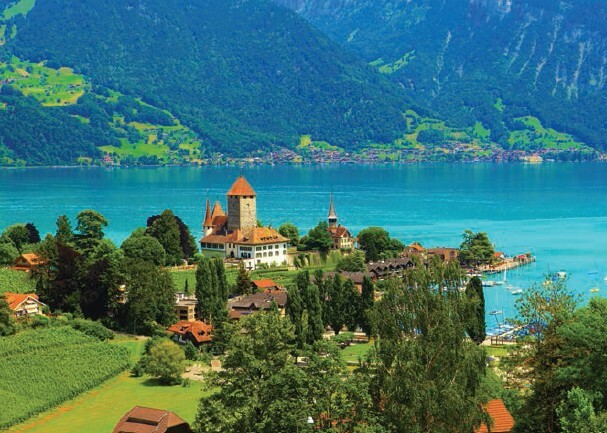 Lake Thun, however, is more popular with movie lovers, given the fact that Humko Humise Chura Lo… song starring Shah Rukh Khan and Aishwariya Rai from Mohabbatein was shot here. With fields greener than imagined and turquoise waters shimmering with golden hues, recreating romance here may potentially become the sweetest memoirs. Switzerland is betting on Bollywood to lure more Indian tourists who are drawn by its picturesque locales that form the backdrop of many blockbusters and is still favourite shooting destination for many film makers who are exploring newer locations. This is the Bollywood magic in Switzerland that has been growing consistently. Keep watching movies with popcorn and cola in the tow and plan Swiss holidays!